COLUMBIA, Mo. – The health of dairy cows after giving birth plays a big factor in the quantity and quality of the milk the cows produce. Now, researchers at the University of Missouri have found that subclinical hypocalcemia, which is the condition of having low levels of calcium in the blood and occurs in many cows after giving birth, is related to higher levels of fat in the liver. John Middleton, a professor in the MU College of Veterinary Medicine, says these higher levels of fat are often precursors to future health problems in cows. Middleton, along with Jim Spain, MU vice provost for undergraduate studies and professor of dairy nutrition in the MU College of Agriculture, Food and Natural Resources, studied 100 dairy cows over two years to determine how subclinical hypocalcemia affected the health of the cows after they gave birth. Previous research done at MU has found that these issues also have a negative impact on cow fertility and reproduction. While the researchers did not find any direct links to health problems, they say correlations with higher levels of fat in the liver call for further research into the health implications of low blood calcium levels. Dairy cows begin producing milk after giving birth, and continue for 11 to 12 months until they are “dried off” by a dairy farmer about 45-60 days before their next calving. To maximize the health of the cows and the amount of quality milk dairy cows produce, Middleton recommends paying close attention to dietary management in the late dry/early lactating period as well as providing supplemental sources of calcium during early lactation for cows at risk for subclinical hypocalcemia. This study was published in the Journal of Diary Science and was a featured article selected by the journal’s editor-in-chief in the November issue. Collaborators on this study include: William Chamerlin, former student and graduate of the MU College of Veterinary Medicine; Gayle Johnson, a professor in the MU College of Veterinary Medicine; Mark Ellersieck, a research professor in the MU College of Agriculture, Food and Natural Resources; and Patrick Pithua, an assistant professor in the MU College of Veterinary Medicine. This research is an example of the University of Missouri’s highly collaborative, interdisciplinary culture in the area of Food for the Future. 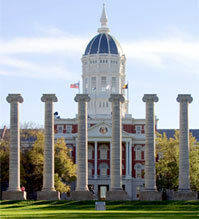 Four key areas of collaborative strength that distinguish MU are collectively known as the Mizzou Advantage. The other three areas are Sustainable Energy, Media of the Future and One Health/One Medicine.